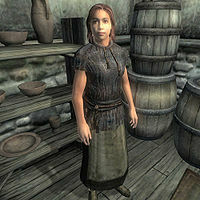 Julitta Plotius is an Imperial commoner living in Leyawiin with her husband Betto. Both are loyal Imperials of a rather racist disposition and would be perfectly happy to see all the Argonians and Khajiits run out of town. As well as sharing the same controversial opinions, Julitta and Betto also like to share their time with one another. Every morning at 6am, they arise and spend the first four hours of the day at home. At 10am, they leave for a two hour lunch at the Five Claws Lodge followed by a walk in the area near the house for sale. At 2pm, they go their separate ways: Julitta heads for the Best Goods and Guarantees for a two hour chat with Gundalas and Elsynia. At 4pm, she moves on and pays a visit to Shuravi and her sisters at the Three Sisters' Inn. At 6pm, if the weather's dry, she will take an evening stroll in the area in front of the Great Chapel of Zenithar, before heading back to the house at 8pm. At 10pm, when Betto gets home, she goes to bed for eight hours of sleep. If it's raining, she'll skip all her outdoor activities and hurry back to her husband in the house. The exception to this schedule occurs once the Drunk and Disorderly quest is initiated. To avoid the drunken, restless Fighters Guild members terrorizing the Five Claws Lodge, Julitta and Betto will skip their 10am breakfast and stay in the house. As with her husband, Julitta wears lower-class attire: a pair of breeches, a sack cloth shirt, and buckled shoes. She carries around her house key and a small amount of gold. She will introduce herself very briefly: "Julitta Plotius. I'm Betto's wife." When asked about Leyawiin, she will, however, be much more talkative: "Well, I don't know much about politics, but I think Lady Alessia's right. We've got to put a stop to all these bandits and rabble in the Trans-Niben. I know the Khajiit are all upset that the Council took away their land and gave it to us, but they just have to get over it! It's our land, now."